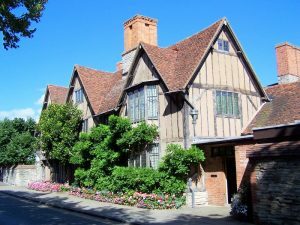 A Blue Badge guided tour of Shakespeare’s Stratford would of course include the Royal Shakespeare Theatre, the Swan Theatre and The Other Place which are all owned by the Royal Shakespeare Company. 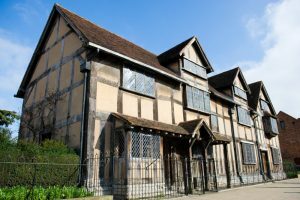 Our Blue Badge Guide, Roger Bailey shows us what else a tour might include as he takes us around five smaller properties that were key in Shakespeare’s life. 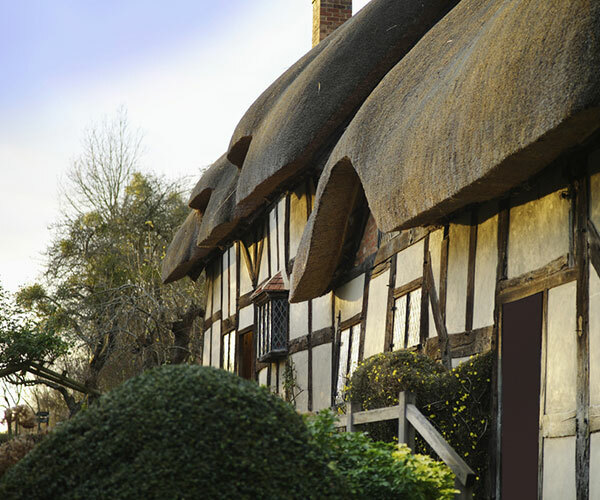 This is the house where William Shakespeare was born in 1564, we believe in the 23rd April. It would bought at auction for the nation in 1847, beating Mr Barnum who wanted to move out to the USA. Originally it was two houses within a terrace of houses. Williams’ father was once the High Bailiff of Stratford. William converted half of the property into a tavern. Visitors sometimes scratched their name on the window panes, all of which have now been preserved. This was the home of Doctor John Hall who was married to Susannah Shakespeare, the eldest daughter of William. It was built in the early 1600’s. It was bought by the Shakespeare Birthplace Trust in 1949. In 1899 the novelist Marie Corelli rented it and lived there for two years. William’s grand daughter Elizabeth married Thomas Nash and lived in this house. It was built in about 1600, the front being a replica built in 1912. Next door is New Place which was built by Hugh Clopton in the late 15th century. It was at the time the second largest house in the town. William Shakespeare bought it in 1597 and died here in 1616 aged 52. When bought by William, it cost £60 in silver according to records. When William died, the house was left to his daughter Susannah. 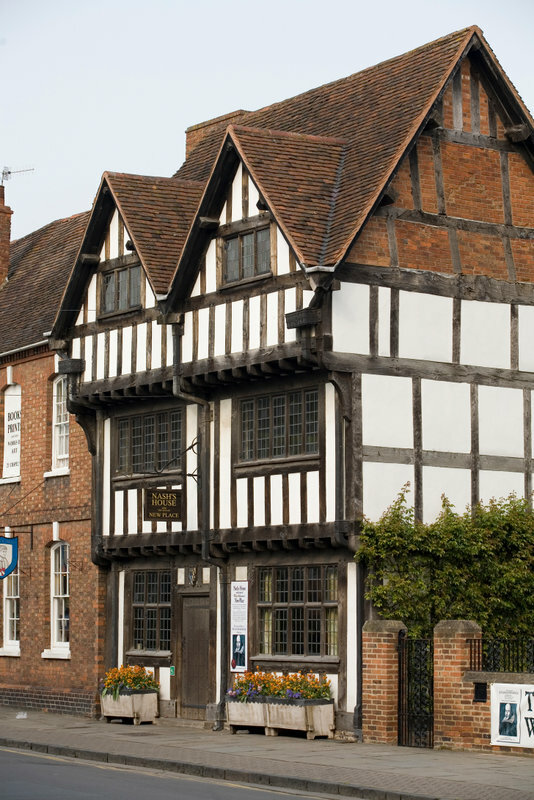 This was the childhood home of Anne Hathaway, who later went on to marry William Shakespeare. It was never a cottage but always a working farmhouse. The oldest part of the cottage dates to the 15th century. Most of the furniture on show belonged to the Hathaway family, with additions made by the Trust. The Shakespeare Birthplace Trust bought the house in 1892. 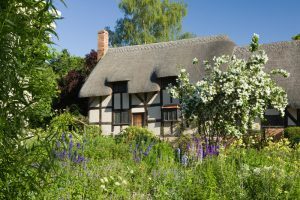 This is located just outside the town and was the family home of Mary, who later became the mother of William Shakespeare. It was built in early 1500. 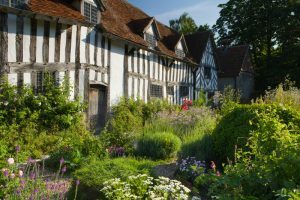 On the same plot is Adam Palmer’s Farm, which was originally thought to have been Mary Arden’s House. It was built in 1569 and added to in 1580/81. Today it is a working farm, where visitors can see people dressed in original clothes of the period.